Professor Dr Tadao Bamba of SUMS said the Japanese university and UKM are doing research on Alzheimer’s Disease and Gastroenterology, particularly Ecology. Gastroenterology is the medical study and treatment of digestive systems and its disorders. 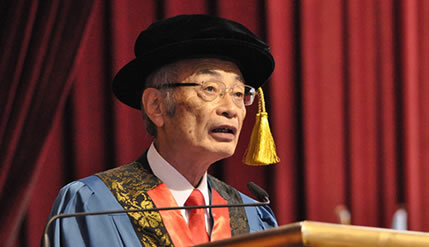 Addressing the second session of the 42nd UKM Convocation after being awarded an Honorary Degree of Doctor of Medical Sciences here today, Prof Bamba said he looks forward to researching Malaysian food, which he described as very rich and very different from Japanese dishes. He acknowledged efforts by UKM’s Medical Faculty and its Dean Prof Dato’ Dr Raymond Azman Ali in strengthening ties between the two institutions through research. SUMS had sent five students in 2013 for short-term attachments to UKM and this year it sent seven undergraduates for the same attachments. He said he was impressed with the professionalism and quality of UKM’s staff and praised UKM’s students saying that there would be more cooperation in the future following the signing of a memorandum of understanding (MoU) between the two institutions in 2011. He noted that since then, there had been numerous exchanges in both directions, especially since UKM had won a big-budget government project to cooperate with SUMS to undertake research on Alzheimer’s Disease. Prof Bamba, who specialises in Gastroenterology, said a lot had been published about the roles of intestinal microbiota, which have effects for and against the pathogenesis of disorders such as Obesity and Diabetes. Collaboration of their respective Nursing Departments had also begun in earnest. Prof Bamba obtained his medical degree (MD) in 1964 from Kyoto Prefectiral University of Medicine and obtained his PhD from the same university three years later. His interest in the study of digestive systems brought him to Guys and St Thomas Hospital in Britain. For three years he worked in sub-specialised research of intestinal absorption, inflammatory bowel disease and clinical nutrition.